Disneyland Park is America's first real theme park, operating for more than fifty years as the self-proclaimed Happiest Place on Earth. In nearly 20 years of writing about Disneyland, I've made a lot of mistakes, which means I have a lot of tips, so you don't have to repeat my slip-ups. Some of the Disneyland tips you see online are great. Some are not. A few tips are just wrong or out of date. I have tested every single item on this list of Disneyland tips. Most of them more than once. To compile a complete list, I talked to other Disneyland fans, theme park experts, former cast members and a couple of fanatic season pass holders, too. The practical tips below can help you make the most of your Disneyland Park visit, but they aren't all the tips in my bag of Disneyland tricks. You can find more tips by reading What You Need to Know Before You Go to Disneyland Resort. It includes tips for packing, things to do and things to check before you make your trip. It also has ideas that apply to both Disneyland and Disney California Adventure. You never know when something will be closed and unfortunately, the Disney website doesn’t keep up. For example, you could visit the web page for one of the restaurants and it wouldn’t tell you that it was closed. For things that really matter to you, your best defense against disappointment is to check. For rides and entertainment, use the daily schedule online or on the Disneyland app, then scroll down to find the list of things closed for refurbishment. If you're a gal going to Disneyland, I know how hard it can be to figure out what to pack. I've been there so many times - and seen all my friends packing failures - that I created a guide just for you. Here's what you need to pack for Disneyland - and what you don't. Where to See the Fireworks: Use our guide to watching the Disneyland fireworks to find out all the best places to see them. Where to Watch Fantasmic! : This show is so popular that it can be frustrating trying to find a good place to view it - and for this one, a so-so spot just won't do. Use our Fantasmic! Tips to find a good viewing spot without having to sit for hours to do it. Where to Watch the Parades: Parades travel between a gate near it's a small world and a gate next to the Opera House. They go down Main Street U.S.A. At the hub, the turn slightly left past the entrance to Tomorrowland, then they circle the square in front of City Hall - or vice versa. You can watch anywhere along that route, but the best place is from the front of the crowd - if you can manage that. You can get into Disneyland early. The program has various names like magic morning or early entry. The details change, but you may get it by staying at a Disney hotel, a Good Neighbor hotel and sometimes with multi-day tickets. Some people think it's a must, but it has some pitfalls. Use these tips to make the most of your early entry. You can also get in early on a morning when there's a Rope Drop. You can get as far as the hub, where you wait for the super-fun moment when the park officially opens. It doesn't happen every day, and it isn't on any schedule, but you can get some tips about it here. Main Street U.S.A. often opens 30 minutes before the rest of Disneyland park. You can eat breakfast, shop, grab a cup of Starbucks or pose for photos with the characters. You can stay at Disneyland after the official closing time, and you don't need VIP status to do it. All you need to do is get into any ride line just a couple of minutes before the official closing is announced and you can stay in it until your ride is finished, even if the ride has a super-long wait. You absolutely must watch your timing for this one - be late to the line by even a couple of minutes and a cast member will kindly but firmly turn you away. If you try this, we hear that the Space Mountain line gets super crowded just before closing time. You can stay in Disneyland late for shopping, too. The shops on Main Street shops U.S.A. stay open after park closing time. They will be packed with people who also put off their purchases to the end of the day, so it's probably best to make your selections earlier and be ready to pay for them right away. If your little Jedi wants to get some training, go straight to the sign up area located near the Autopia entrance immediately after the park opens. Spots are open by reservation only and are on a first come, first served. Your child must be with you when you register and must be between four and twelve years old. You don't have to be a VIP to get someone else to take care of your purchases, either. If you're staying at one of the Disney hotels, you can ask to have your packages delivered to your room. Otherwise, you have them put on hold for you to pick up later. Your salesperson can fill you in on pickup locations. But wait! There's 11 more! Check out these 11 Things You Didn't Know You Could Do at Disneyland. City Hall and Guest Relations are just inside the left tunnel after the entry plaza. That's where you can pick up a button for your special occasion. They can also help you with a multitude of questions and issues, including getting an access pass if you have mobility concerns. First Aid is just off Main Street. You'll find it by walking past down the side walkway past the Corn Dog cart. That's where you can get an aspirin your headache, a bandage for your blister or get help with any other medical need. The Baby Care Center isn't as well known as it might be, judging from the number of moms I've seen struggling to take care of their littles ones around the park. It's also near the Corn Dog cart. They have quiet places to change a diaper, rock a cranky baby or nurse in a more private setting. And your littlest ones will absolutely adore those child-sized toilets, which are restricted to little ones less than 42 inches tall. If your phone battery is running down from all the texting, game playing, taking photos and posting to social media, you can find battery powered lockers next to the Cone Shop on Main Street U.S.A. Or try this list of electrical outlet locations or the Mouselets app. Disneyland is a no smoking area, except for the places on this list. Did you lose something? Someone may have returned it. Lost and found is outside the main gates on the left. Did your balloon pop or did your mouse ears fall off? According to a cast member at the Main Street Emporium, you can get a replacement on the day of purchase. City Hall is where children wait for their lost parents to show up, and it's a good, easy-to-find spot to meet your entire group. It's just on the left after you go through the tunnel. The Snow White Grotto next to the castle is also a good place to meet your group. And a fun spot to take a group photo with fewer photo bombers in the background. Veer to the right just before you reach the castle's drawbridge. It's a good idea to walk there together as soon as you get in so everyone knows exactly where it is. If you're craving a Disneyland corn dog - and who doesn't once in a while - you don't have to stand in a long line and balance your dog on your knee to eat it. The Stage Door Saloon has the same corn dogs, but shorter lines - and there's a place nearby to sit down. Or go inside the Golden Horseshoe to sit. The Stage Door Saloon serves ice cream nachos. They're a hidden item that you won't see on the menu board, but all you have to do is ask. What is an ice cream nacho? It's ice cream served atop pieces of crunchy waffle cones. If you want to enjoy the nearly legendary Disneyland Monte Cristo sandwich, you can make a reservation at the Blue Bayou restaurant - or you can get the same sliced turkey, ham, and Swiss cheese sandwich fried in a light batter at the Cafe Orleans. Mickey-shaped beignets (New Orleans-style donuts) are also on the menu at Blue Bayou. If you're dying for a Dole Whip but fear you'll die standing there in that long line, slip into the Tiki Room waiting area and order from there. There's a hidden patio where you can eat in peace next to Rivers of America. It's behind the Harbor Gallery, which is across from Haunted Mansion. The passageway behind it looks like it might be for cast members only, but it actually leads to several quiet tables. No alcohol is served anywhere in Disneyland, except in members-only Club 33. Use the Main Street conveyances to save some steps between the train station and the castle. Don't just stand there looking at them and say "how quaint." Get on one and save some steps. You might get a chance to travel in a horse-drawn streetcar, a fire engine or a spiffy yellow jitney - that's an early automobile without a roof. Ride the train to save even more steps. 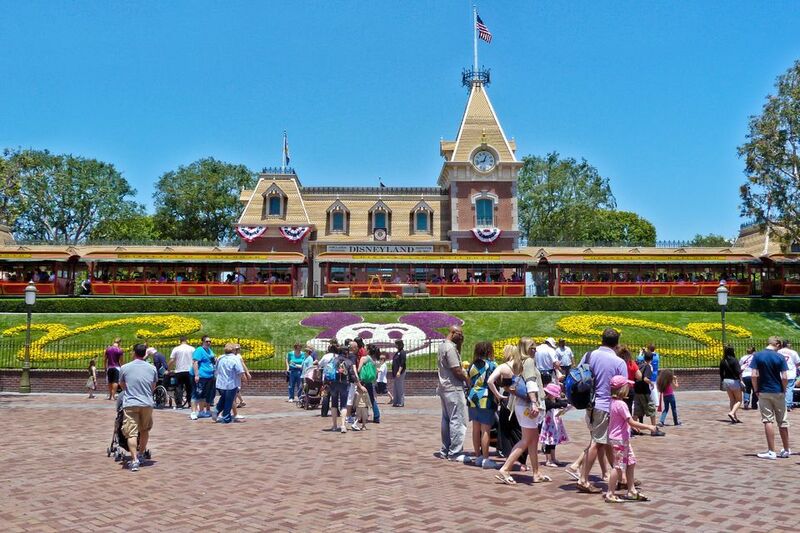 It stops at the station on Main Street, at New Orleans Square, Tomorrowland and Toontown, a 1.2-mile round trip. Take the monorail, too. It stops at Tomorrowland and at a station in Downtown Disney, which is a convenient place to get into the park. Walking to New Orleans Square quickly: Don't take the obvious route through Adventureland. Instead, use the Frontierland entrance where you won't get tangled up in the bunches of people who are trying to get onto Indiana Jones and the Jungle Cruise. To get down Main Street U.S.A. during the parade or fireworks, don't fight your way down the sidewalk. Instead, use the side of Main Street where the Carnation Cafe is and walk inside the shops as much as possible. To get the most out of Disneyland and the magic that went into its making, you need to get into the details. These are a few of the ones that I have discovered that I think make the place so special. The windows on Main Street U.S.A. have lots of names on them. It's fun to check them all out and even more fun to know that they all honor real people, who are former employees or friends of Disneyland. My personal favorite is the Palm Parlor, dedicated to imagineer Rolly Crump who designed the Haunted Mansion and many other rides. Hidden Mickeys are something you hear about everywhere. All it takes is three circles to create the iconic mouse silhouette. There's even a book to help you find them. It's fun to look around for them. Touch everything in Toontown. Almost everything in the area around Roger Rabbit's Car Toon Spin does something. Pull on a door handle and you might hear an explosion. Pick up the telephone and you'll eavesdrop on a hilarious call. I won't spoil the surprises by telling you all the other things you can find there, but don't miss the water fountain. Listen in on a Party Line. Just inside the Main Street U.S.A. Starbucks entrance, you'll see two old-fashioned telephones on the wall. Pick up a receiver and listen in on a lively conversation between a couple of very gossipy women. Step into the side area near the Starbucks entrance and walk toward the back, where the lockers are. You may hear Goofy and his friends getting ready for the day - or some disturbing sounds coming from the dentist's office. Those yummy smells near the candy shop on Main Street U.S.A are coming from a vent beneath the window. Snow White Grotto: There's a wishing well and marble statues of Snow White and the 7 Dwarfs to the side of the castle drawbridge. The soundtrack playing in this quiet little corner is from the film. Guests can toss pennies into the wishing well which are donated to children's charities. This romantic little spot is also a perfect place for a marriage proposal. Rub the brass apple outside Snow White's Scary Adventures and you'll hear the witch cackle. Wicked Witch is Watching: If you're in line at Pinocchio, look at the upstairs window of the Snow White ride, and you may catch the Wicked Witch pulling open the curtains to peek out of the window. A voodoo priestess curses in the restrooms near the New Orleans Square train station. The New Orleans Square train station telegraph isn't just making random dot and dash sounds; it's spelling out the opening lines of Walt Disney’s opening day speech in Morse Code - or so the experts say. Where to Rest: You could just lay down on a bench and catch a few winds, but that's a little too public for me. However, I may or may not have taken a short nap while watching Great Moments With Mr. Lincoln in a cool, dark auditorium. The Tiki Room is also air-conditioned, and the show is long enough that you'll feel refreshed afterward. I have a lot more tips for enjoying every single ride and show at Disneyland. They're in the Disneyland Ride Guide. The Haunted Mansion doesn't give out death certificates. I pity the poor cast members at who must be tired to "death" of being asked for one. People report visitors getting more than reasonably upset about this, shouting: "PINTEREST SAID YOU WOULD!" Get over it now. They don't give them out and apparently never did. You can't get a jungle cruise map from the skipper anymore, either. But you can download one for yourself from the Disney Parks Blog. “Toy Story” characters like Woody, Buzz and Jessie don't drop to the ground and play dead if you yell: “Andy’s coming!” You can imagine that one got old pretty fast. Answer poll takers' questions if you want to, but don't expect to get any rewards or free tickets for doing it. The lavender teacup is fastest. This may have been true before Disney regulated their speed in 2004, but it isn't true now. Step into the walkway next to the perfume shop in New Orleans Square and listen. You'll hear tinkling bells and soft chanting. I haven't confirmed this, but it sounds like a voodoo priestess to me. She is sometimes mistakenly reported as being in the restrooms nearby, but what do I know? Maybe she moves around. Driver's licenses aren't free at Autopia any longer, either. You can find the Cheshire Cat at the Mad Hatter Gift Shop, but he doesn't appear IN the mirror. Instead, he's part of the mirror frame. You can't use an expired FASTPASS. Cast members would once accept an expired FASTPASS any time after its official end time, but now they only allow a few minutes' grace period. This killed a lot of older touring plans that depended on using expired passes. You Can't Get 4 Fastpasses Within 15 Minutes of Entering Disneyland, no matter what you see on Pinterest. In fact, that pin no longer leads to the same content it once did. Lines 13, 20, or 21 move fastest at the Disneyland entrance - or so people say. I won't say this one is wrong, but I'm skeptical about whether it's true. The Secret Restroom which was near the Carnation Cafe is now gone. Don't try knocking on the door to the Ink & Paint Club at Roger Rabbit’s Car Toon Spin and saying Walt sent me. I did it and looked like a buffoon so you don't have to. In fact, nothing happens. The window opens sporadically, but knocking doesn’t affect it.